SEO is still going to be the biggest player in the online world in 2013. Online learning… Don’t know much about it, but it’s probably going to grow. Some great tips in here, even if you only take one thing out of it, it will make you look at your Analytics differently next time you get in there. Google Analytics provides a means of measuring what your site is trying to achieve online. Take a step back and reflect on what your business objectives are and what actions you want visitors to perform on your site. By defining your goals in Google Analytics in terms of these website actions, you will have specific, quantifiable measures with which to gauge the success of your online efforts. If we think about the aim of SEO (aside from achieving top rankings for your target keywords) as driving qualified consumer traffic to your site in order to generate sales or sales leads for your business, you start to clearly see where you are headed with your analysis. We are interested not only in the traffic that is arriving at your site, but also in the quality of this traffic, as measured by the conversion rate. PLEASE NOTE: This article is concerned with assessing the performance of an SEO campaign. All analysis presented relates only to that segment of traffic generated from organic search. Reviewing trends in your organic traffic over time will provide far greater insight into SEO performance than a single metric like total visits. Looking at trends provides much needed context to your results. How does the data look? Is there an upward trend or downward trend in organic visits over time? Is there a significant proportion of organic visits coming from new visitors? Effective SEO campaigns should be successful at driving new visitors to your site. Has SEO driven more or less visits to your site when compared to last year? Has your organic traffic performed in the manner you would expect based on your SEO spend between the two periods? How have the other site usage metrics performed across the two periods? Is your site receiving more new visitors than the previous year? And what about bounce rate? Are there improvements here? Does this correlate to web design updates you have made to your site within the same timeframe? Understanding where your traffic is coming from can tell you a lot about the strength of your SEO as well as providing inspiration for future optimisation efforts. 1. Which search engines are generating the most traffic? Ideally, the proportion of traffic your site receives from each search engine should roughly equate to the market share held by the engine. Google controls more than 90% of the search market in Australia so we would expect the dominance seen in the table above. Optimising your site for Google is the hardest but will ultimately bring you the most benefit in terms of traffic and profit. Where results differ significantly to what you would expect, it may mean that the search engine in question is not indexing your site or providing consistent exposure for your site – all of which points to the need to customise your SEO strategy for this particular search engine. 2. Which regions are generating the most traffic? Geography will most likely have an impact on the performance of your SEO campaign. Are there regions generating traffic to your site that you hadn’t considered previously? Are these regions providing quality traffic, in the sense that the bounce rate reflects a degree of engagement with the site? Can you optimise your site to cater for these visitors and in doing so generate further conversions and online revenue? What keywords are delivering the best performance? 1. What are the top keywords driving people to your site? The keywords driving the most traffic to your site are not necessarily the same keywords generating revenue or value for your business. 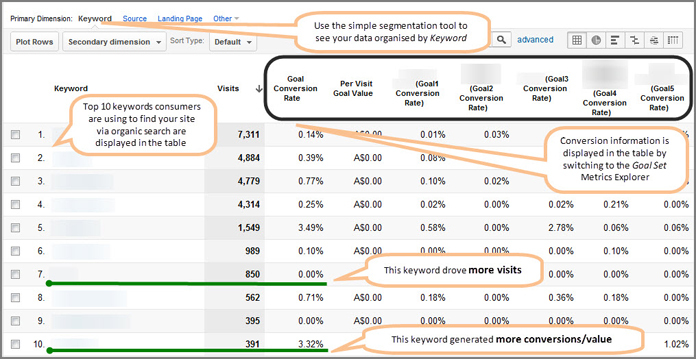 Where keywords drive traffic but not conversions, look to the landing pages where traffic from these keywords arrive. Perhaps the content is inconsistent both with the keyword and with what consumers are expecting to find from their search? 2. What are the top converting keywords? I encourage you to try this out with your own Google Analytics account. I think you will be surprised at how different these two lists can look. Are there keywords you did not expect to see converting? Are you optimising for these in your SEO campaign? We could refine our results even further by excluding branded keywords from the analysis using Advanced Filters. In fact this would provide a much more accurate picture of how successful your SEO campaign has been at expanding the exposure of your site to consumers not already familiar with your company. Only a small percentage of your traffic will convert. And here I’m talking about visitors performing the action which you have designated as your macro conversion…The reason for which your website exists…The action which directly increases revenue or leads for your business. The remaining traffic, the percentage that did not convert at your macro goal, is still valuable. Actions that these visitors take may result in the prospect returning at a later date to make a purchase. 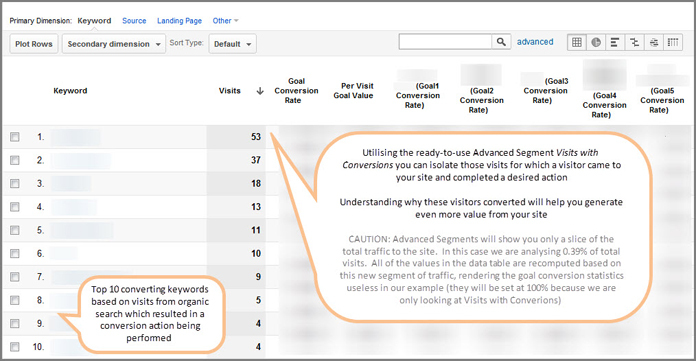 We call these actions micro conversions and I cannot stress how important it is to track these within your Google Analytics account alongside your macro conversions. It will give you an excellent impression of the bigger picture and an appreciation of the other actions consumers are completing on your site which contribute to the overall success of your business online. Is SEO driving direct conversions? What about assisted conversions? Direct conversions result when a marketing channel drives traffic to your site (in our case organic search) and these visitors convert straight away. Not all traffic will immediately convert though. And just because something did not convert or generate revenue does not make it worthless. In those instances where organic search does not appear to be generating direct conversions, investigate whether this channel is playing a role higher up in the buying process. This report may be quite revealing. Organic search could be contributing to conversion performance in a much greater capacity than first thought. Or perhaps there are other channels which have been hidden previously, that are playing a significant assist role and could be worth leveraging further. High-level analysis is a good place to start when assessing your SEO performance. But real insight is gained by digging deeper into your data set. Look for features which characterise your successful traffic and promote these. Try and identify why segments of your traffic did not convert and make changes to your site optimisation. Start analysing today and improve your SEO performance with the information you find. SEMA day three, finished. I’m glad to be back in my plush Las Vegas Hilton room. It’s hot, and long days round here. Well thats the second day of SEMA done and dusted. Few more photos of what I got to see around the show. Well the first day of SEMA is over, after all the preperation that goes into a show like this you are glad to just make it. We made some great contacts, the OUT4X4 brand is going to go big. The excitement behind anything Jeep related in the USA is crazy. Great little reminder even for me, sit back and think about it… Then break it down. Found it on the Digital Buzz Blog. It’s interesting to look at how a strategy brain works, more so, the transition of traditional strategists or other agency types who are getting into digital strategy… So, I thought it would be great to share this SlideShare presentation from my mate Julian Cole, who’s the digital strategy director at BBH in New York. The presentation provides a pretty simple framework for digital strategy thinking and the process to get good ideas out… It’s smart… Read it. Learn it. Practice it. Make awesome work.